Together we will raise awareness and create action as we examine community and fair housing issues. We will also advocate for changes to the Fair Housing Act to expand fair housing protections based on sexual orientation and gender identity. As stewards of the right to own, use and transfer private property, fair housing protects our livelihood and business as REALTORS®. You can always count on the professional Licensed Realtors at Appalachian Realty to protect your individual Rights. 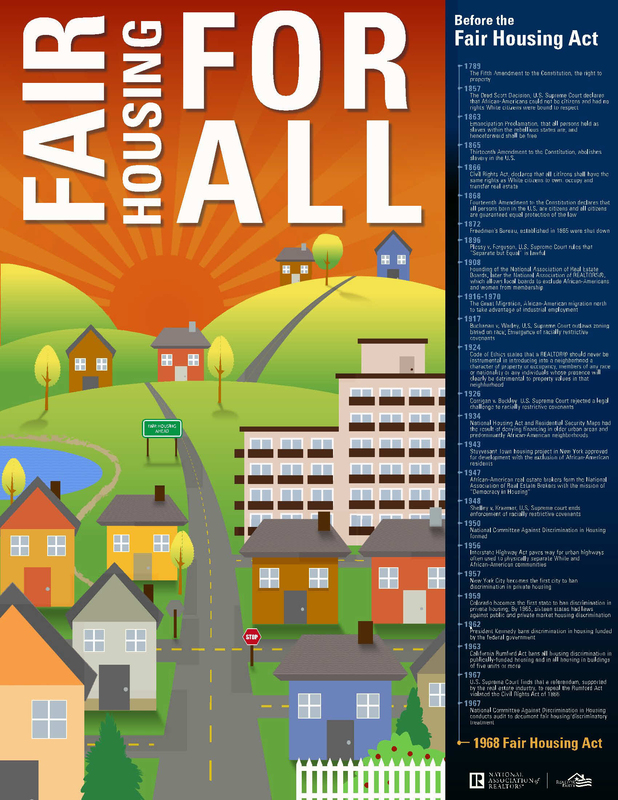 The poster below is a timeline of the progress of the Fair Housing Act. The Virginia Association of Realtors® worked to help develop legislation to enhance the agency relationship disclosure requirements between licensees and those they represent. This means there are a number of changes to the existing agency laws in Virginia, and VAR wants to make sure that our members and you, the client or customer, understands how it works and what you can expect. So, why do you have to sign brokerage agreement? The short answer is that Virginia law requires it in order to protect you. The longer answer is that having something in writing — whether it covers a single property or a months-long relationship — ensures that both you and your Realtor® understand exactly what's expected from each other. Be sure to discuss your options with your Realtor®, and make sure all your questions are answered. In the past, when you have purchased a home you may have worked with a real estate agent with no written agreement in place. As of July 1, 2012, it is now the law in Virginia that written agreements must be in place for many services to be provided by a real estate agent, similar to how it is with many other types of professional business relationships. A real estate agent's job is to help guide you through the complexities of buying or selling a property. But not everyone with a real estate license is a Realtor®. A Realtor® is not just a real estate licensee, but is also a member of the National Association of REALTORS®. What's the difference? Realtors® must meet stricter education requirements than the law requires, and they're bound not only by that law, but by the higher standard of the REALTOR® Code of Ethics. That's why only Realtors® are allowed to use the famous Realtor® "R". Your Realtor® is committed to protecting your interests throughout the entire transaction with the integrity, honor, professionalism, and expertise that meets the high standards set by the "Realtor®" name. And Realtors® have access to more and more sophisticated tools to help sellers market their properties to the right audience, help buyers find just the right home, and make the entire process run smoothly. You'll find your Realtor® isn't just an expert on your local real estate market, but also a trusted advisor who can help you navigate a complex transaction. Below is a link for more information. If you have any Questions about this, please don't hesitate to call our office for an Agent to explain this important Law change to you.